Peers say that they have never seen anyone with Cavendish's hunger for success and while this fearlessness - both in the saddle and on the record - has at times led to controversy, it has also earned him the respect of ever more fans. In Boy Racer we follow him through the mayhem of the Tour de France in a page-turning journey of pure exhilaration. 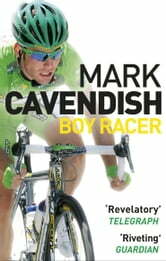 After reading this book, I 've changed my opinion of Mark Cavendish. He sets his goals in cycling, and then works hard to achieve them.